Welcome to the Anchorage Hockey Academy. Here at the Anchorage Hockey Academy we pride ourselves on having the most complete camp experience in Alaska. Our facilities and curriculum modeled after the American Development Model provides players with elite training, both on and off the ice. Players who attend our hockey camp will receive 2 hours of on-ice training each day. These sessions will teach players the necessary skills and techniques needed to grow their game. Our expert coaching staff will provide players with tips and tricks of the game that they can take with them long after the camp ends. Along with the elite on-ice training, players will participate in a variety of off-ice sports, games, and age specific training. The multi-sport environment will allow the players to reach their maximum potential as an athlete, thus raising their level on the ice. The off-ice activities will consist of swimming, soccer, lacrosse, kick ball, wiffle ball, age specific training, and a variety of other games! The better the athlete, the better the hockey player! 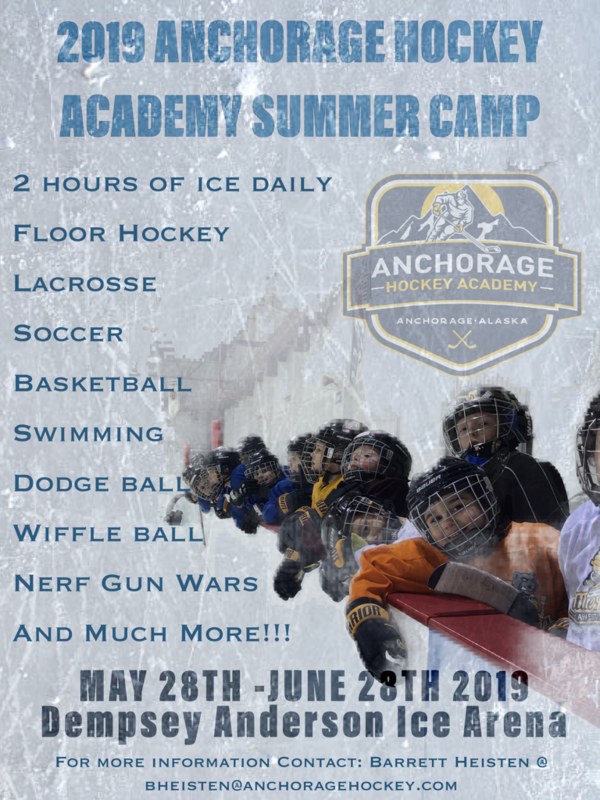 At the Anchorage Hockey Academy players will have a blast becoming the best athlete they can be! If you're interested in registering for our 1/2 option - you'll first need to contact Kirk Kullberg to receive the "1/2 Day Discount Code." You'll need this code before you register your child. PAYMENT PLANS - Available for full camp registration.